Located just off of the Trans-Canada Highway between Mill Bay and Victoria, the Bamberton Provincial Park provides a campground in a forest of arbutus, excellent fishing and good beaches fronting into the Saanich Inlet. The Saanich Peninsula, Gulf Islands and Mount Baker are just some of the stunning views from the park. The park area encompasses 251 hectares filled with hundreds of species of plants and animals, all of which have adapted to the wide range of conditions. Killer and Grey whales, sea lions and seals have been observed in the offshore waters. From Port Renfrew which is located on the west coast of Vancouver Island on Highway 14, there is a good gravel road to a very large parking lot and a 15 - 20 minute pleasant walk in the woods to the beach. Visitors must pack supplies and garbage in and out. This 21,849 hectare park is a rugged scenic area on the northwest tip of Vancouver Island. The nine beaches of the park total a length of about 23 kilometres. At Port Hardy follow 67 km of logging roads to the parking lot and entrance of the park. Wilderness camping areas are available on the beach. An extensive network of trails of varying length and difficulty lead through the park. The park is located just off of Highway 14 northwest of Sooke on the Juan de Fuca Strait. A campground, picnic area, boat launch, good beaches, angling oppurtunities, hiking trails and whale watching in the spring are just some of the parks features. The Goldstream Provincial Park is a nature enthusiasts paradise. The park is located 19 km northwest of Victoria. A 150 site campground with toilets, water, showers and wood nearby is found within the park. An extensive trail system and self-guided nature walks lead the way to the parks scenic features. The park is located north of Duncan on Highway 18 on the south arm of Cowichan Lake and provides a campground, boat launch, hiking trails and excellent fishing for Dolly Varden, rainbow and cutthroat trout. The park is open year-round. Located approximately 60km (37mi) north of Nanaimo and 12km (7mi) off the Island Highway (Highway #19). Turn west off the main highway at Horne Lake Road and follow signs leading to the park. This 123 hectare sized park protects and preserves a small portion of the Qualicum River and the Horne Lake Caves. The park is located south of Campbell River, 3 km (2 mi) off of Highway 19 on Elma Bay near the north end of the Georgia Strait. Sandy beaches, a fully facilitated 193 site campground, and picnic areas are just some of the parks attractions. Hiking trails lead through a second-growth forest where abundant species of plants and animals are resident.Daytrips such as hiking on Forbidden Plateau, visiting the Mitlenatch Island seabird colony, Cumberland's historic sites or visiting nearby Denman, Hornby, Quadra and Cortes Islands are all interesting ways to explore the area. 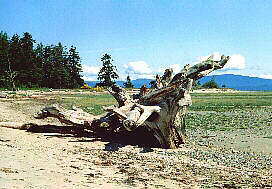 The park is located northwest of Campbell River via Mohun Lake on the Menzies Bay logging road. The park fronts onto both Morton and Mohun Lakes which both provide good beaches and angling oppurtunities. Hiking trails lead the visitor through a forest of Douglas-fir, hemlock, cedar and white pine or to nearby Andrew Lake. Boating and canoeing are good ways to explore the areas waterways. A small campground is provided. Located at Ganges on Saltspring Island, this park was donated by the Mouat family who were island pioneers. The island was first inhabited by black slaves who escaped from the United States. A campground and picnic area are provided. This marine park encompasses an island of 306 hectares where a shoreline of sandstone cliffs, with caves and caverns within, meets sandy gravel beaches. Newcastle Island is accessible by boat from Nanaimo. There are 18 tent sites available with toilets, wood and water nearby. Group camping facilities may be reserved. Trails provide access to all areas of the island. Located 19 km (12 mi) west of Parksville on Highway 4, Little Qualicum Falls Provincial Park provides the visitor with a campground, picnic areas and hiking trails leading to waterfalls and swimming holes. Nearby attractions include Cameron Lake, ocean beaches and Cathedral grove . The Sproat Lake Provincial Park is located on Highway 4, 14 km west of Port Alberni. Sproat Lake, home of the world's largest water bomber, is a superb area for fishing, swimming and waterskiing. Ancient native petroglyphs are located nearby. A picnic area and firepits are provided. Two campgrounds, with 60 sites combined, provide water, wood, toilets and a sani-station. This park is located on Beaver Creek Road, 14 km west of Port Alberni. Photographers and nature lovers alike will find the area particularily rewarding in the late summer and early fall as the leaves change colour and the chinook, coho and sockeye salmon make their annual spawning migration up the areas rivers. The 22 unit campground provides water, wood and toilets. Fishing in the nearby waterways for cutthroat trout and steelhead may prove to a productive activity. Located just off of Highway 4 on the north shores of Sproat Lake west of Port Alberni, the park provides the visitor with group camping facilities, a beach and angling opportunities.